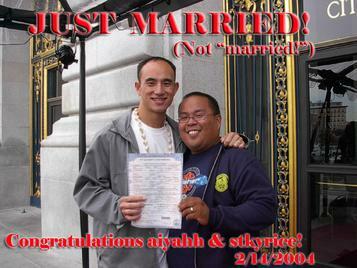 So you may recall that our friends stkyrice & aiyahh got married at San Francisco City Hall on Valentine's Day (and, of course, that jozjozjoz got to be the Maid of Honor in an Undisclosed Location™!). Evidently, aiyahh (Howard, on the left) and stkyrice (Efren, on the right) are now the World's Most Famous Married Gay Asian Male Couple™. 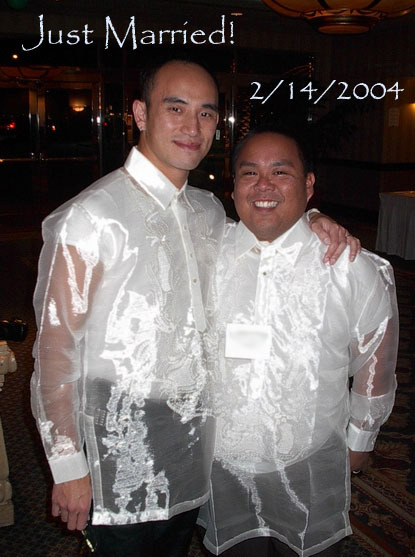 If you're in the SF Bay Area, you may be able to catch them should know that they are being interviewed on KTSF TV tonight to be part of a 5 part series on queer Asian couples in SF. Listed below are links to weblogs that reference this post. oh niiiiiice. i gotta make it out there. this is too cool! you realize i do'nt like being placed right above william hung! second update: we'll be featured end of march/beginning in april in the 5 part series for both the cantonese and mandarin news on KTSF-TV 26 in SF. i'll let you know the exact dates as soon as i find out.